Well, not no more. I have put together the first issue of a new monthly ICANN “magazine” with help from a wide range of staff, and you can view it on the ICANN site or sign up to receive it via email direct to your inbox each month. It is a magazine rather than a newsletter as it pokes into most of the different crevices of ICANN and so is much longer than a newsletter would be. Plus it goes into a fair amount of detail (with links to more information if you’re interested). It also has two interviews: one with CEO Paul Twomey and one with Janis Karklins, the GAC chair. The idea is that if you want a quick overview of what has happened within ICANN the previous month, you get it all in one email. By linking to alot of other resources across ICANN sites, the hope is also that people out there will discover the spots where ICANN information is placed – the public participation site for example. The fact is that ICANN does make the vast majority of its work freely and publicly available – it’s just getting to it that’s the problem. This magazine should help solve a big chunk of that. But if people can think up interesting and useful alterations or additions to the magazine, just post them here where I’ll review them and if they’re good, make them to next month’s issue. 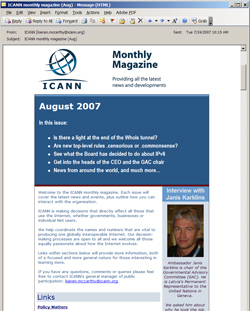 Anyway, sign up and view the first issue at http://www.icann.org/magazine/. Next issue out the end of August or very early September. About a fortnight ago, I pointed out the new public comment page on the ICANN site. People seem to find it useful but there’s not been that much feedback which leads me to suspect that not enough people know about it. However, it is starting to come together as comment periods come and go and it is growing into a useful resource. One issue has been the “summary/analysis” of comments at the end of a comment period. We have agreed that the best way for ICANN staff to approach this is through professional objectivity, thereby providing a fair and unbiased view of what the comments made say. There is some concern that the comments made in a forum frequently represent only one viewpoint, but then the summary/analysis is not about the overall process, it is simply a review of the comments made in a public comment period. If only one viewpoint is expressed in public comments, then there’s nothing to stop that being subsequently pointed out. And hopefully it will also encourage people with other viewpoints to make theirs known as well, so we can get a real online discussion going. The hope is that a policy of openness and fairness will restore faith in the public comment period and it can start serving the useful function it was always intended to. Tied in with this, we are considering having a staff response in which some of the issues addressed in earlier comments can be tackled by the member of staff following the process. Often there are comments, or part of comments, that raise questions that can be simply answered then and there, but there is no real mechanism to get that out there. A staff posting say a week before the deadline ends (to give time for response from the community) might help push the issue on further and faster than the rather slow and bureaucratic system in place at the moment. It may also introduce some valuable interaction plus help demonstrate to the community that the staff do actually read the comments made. People’s views on this are welcome. Another thought in my head is to shift from a non-interactive email comment forum to a much more interactive Web-based forum. This would allow people to thrash around ideas, raise issues, deal with misconceptions are so on, in a useful way. At the moment, the system feels a little stilted, and usually people that go to the trouble of making a comment don’t see what impact it can have on thinking. That’s a waste of ideas and resources, where an interactive online forum might help pull the best ideas out more and hopefully encourage more participation. Of course the risk is that it could turn into a GA-list-style bun-fight with people spending more time being personally offensive than actually discussing the issues. Plus there is the normal fear of change that always creates tension. And there would be the issue that the staff-written summary/analysis will be much, much harder to write and could cause argument in itself, but it is very possible that the advantages may outweigh the disadvantages. We may experiment and see if it’s useful. Again, all thoughts welcome. You have the transparent and accountable ICANN listening so be heard now while we are building up new systems for interaction.